Adding a plant to your home is the easiest way to surround yourself with a little bit of Mother Nature and as for those outdoor plants? They need some tender loving care too! The good news is we’ve uncovered 60 amazing DIY tutorials which teach you how to create planters you’ll love – whether it be making over a terracotta pot, embracing height through a hanging planter, getting in touch with your quirky side with some easy-to-make novelty planters or even creating some hardy outdoor planters. Thankfully, you’ll find it all here. The following tutorials show you how you can transform an ordinary terracotta pot into something quite extraordinary! 1. The ladies at A Beautiful Mess have created these bohemian inspired, lace-adorned terracotta plant pots using just a handful of materials which are probably already lying around your house! The lace creates such lovely and intricate patterns. 2. If you fancy a bright and eye-catching DIY tutorial to jazz-up your plain terracotta pots, then you’ll love this marbled effect by Bespoke Bride. You can also create this design in any other colors of your choosing! 3. Although simple, this DIY idea from Best Friends for Frosting packs a real punch in terms of adding a modern and bright touch to your décor! The neon pink hue is highly on-trend, however feel free to mix it up with different shades of your choice. 4. Let’s face it, to the average non-herb-educated person, many of the plants often look the same! As a result, it’s hard to distinguish exactly what is what. This DIY pot plant idea will aid with any uncertainty, as Bodhi Luxe incorporates each herb’s name into the pot’s design. 5. What a genius project idea from Christine Chitnis! Every craft-lover has bits and pieces of spare material lying around at home, so why not use it to cover your terracotta pots and add a unique touch? 6. Embrace the French provincial aesthetic in your home quite easily (and on the cheap!) by following this simple and fun tutorial from Climer Photography. By transforming your plant pots with a white wash and farmyard-inspired designs, you’ll instantly add that French touch. 7. Is there anything more eye-catching than the shiny color gold? These eclectic pot designs from Delia Creates will have your guests envying your DIY and craft skills, but little do they know just how easy these are to create! 8. Not only does this amazing tutorial by Design Sponge teach you how to create this stunning pattern, but it also gives you step-by-step directions on how to create these jewels yourself using moulds. More experienced crafters won’t want to miss this! 9. The talented Design Sponge does it yet again with this wonderful tutorial teaching you how to achieve this wavy, ombre water color design. This tutorial is perfect for the home owner looking to add modern and on-trend elements to their home on a budget. 10. Do you have nail polish sitting around on your vanity table? Did you know that you can use the lacquer to create this stunning effect on your terracotta pots? Follow this super easy tutorial by Hello Natural to find out how! 11. These painted pot plants from I Spy DIY might look incredibly creative, but they’re also very easy to make. The black and white design is very simple to create and the monochromatic palette will work well with any décor! 12. I Spy DIY creates a slightly different alternative to the previous water color ombre, as this design features a straight ombre style against a crisp, white background. These pots are seriously pretty! 13. If you were to see these pots already made in a boutique, they would easily set you back a small fortune. The good news is that you can actually create this unique look yourself from the comfort of your very own home using easily attainable materials, thanks to this tutorial from Kate Bello. 14. Upon seeing these gorgeous plant pot designs from Miss Renaissance, one word certainly comes to mind – ‘Wow’. Who needs to have plain old terracotta pots on display when you can create works of art just like these, using your favorite shades of paint and gold foil? 15. This creative DIY design by My Clever Nest is as easy as 1, 2, 3. All you’ll need to do is give your terracotta pot a fresh coat of white paint, before dropping some yellow paint on the pot and letting gravity do all of the hard work for you! 16. This set of three designs by Nest of Posies really adds wow-factor to otherwise boring terracotta pots. Embrace glitter, white paint, your favorite quotes and gold foil to bring this creation to life in your own home. 17. 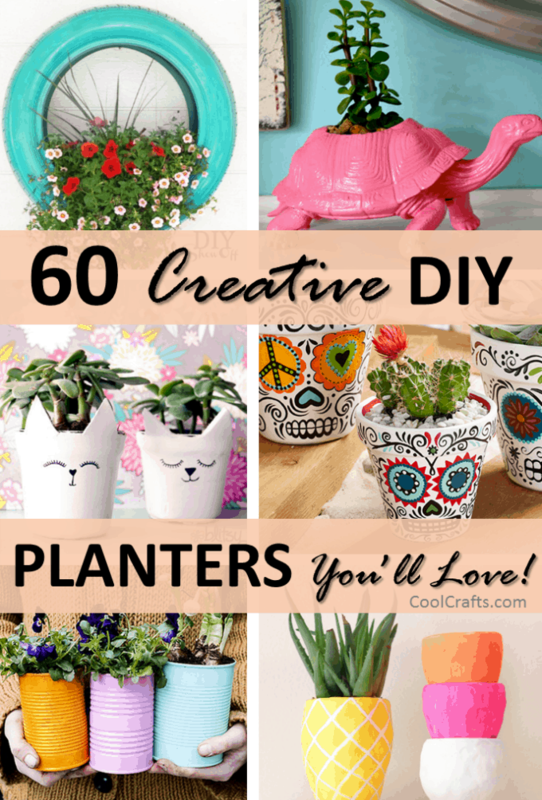 Not just for Dia de los Muertos (also known as the Day of the Dead), this fabulous and crafty idea by Plaid Online for transforming your plant pots is pure genius. Have as much fun as possible creating those intricate little designs! 18. Got three terracotta pots lying around in the backyard? How about you do what Positively Splendid did with hers and transform them into a stacked planter? With a polka-dot design, this DIY project will have your neighbors green with envy! 19. This tutorial from Show Me Pretty is perfect for beginner crafters, as all you need to complete this pot design is basically white paint and a gold marker. It’s that easy! 20. From afar you’d be forgiven for thinking that these glorious pots from The Crafted Life contain little polka dots, when in actual fact, they’re tiny triangles! The combination of pink, black and white is a match made in heaven and really gives this previously plain terracotta pot a new life! 21. 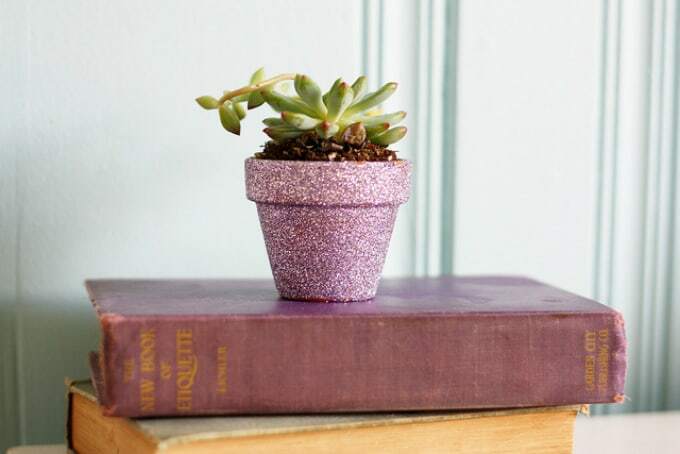 When it comes to most DIY craft projects, you just can’t go wrong with glitter! Even the humble plant pot needs some sparkle and pizzazz and we think The Pretty Bee has truly mastered this with her simple tutorial. 22. When it comes to this season’s décor trends, gold-dipped anything is definitely on-trend! The Style House shows us how we can apply this trendy technique to our plant pots in order to turn them into statement pieces around the home. 23. Add a vintage twist to your pots using crochet and lace material and you’ll soon have the prettiest pot plants on your porch! Urban Comfort shows you how to easily achieve this cheap yet amazing look. These projects involve easily transforming and upcycling old items into the prettiest hanging planters! 24. Fancy creating a unique hanging planter on the cheap? Take a leaf from DIY Show Off’s book and upcycle an old chandelier! Paint your chandelier in an eye-catching hue or use metallic paint for a more regal take on the design. 25. Got a few pots laying around but you don’t know what to do with them? Take an hour out of your schedule (if that!) and follow Drifter and the Gypsy’s tutorial teaching you how to create this string plant hanger. Then, simply hang your plant somewhere special to quickly transform the space. 26. This DIY hanging colander plant holder tutorial from Mommy’s Kitchen is yet another perfect example of upcycling old wares in order to save money and give a tired object a new lease on life. 27. Mason jars – we all have them, but the question is, what crafty things can you do with them? Oh So Very Pretty has found one amazing use for the humble jars and shows you how to turn them into hanging plant holders. Genius! The following tutorials will teach you how to create the quirkiest and cutest planters on a budget using easily acquired items! 28. Attention book lovers, you’re going to love this fresh new planter idea from Apartment Therapy! Turn your old and damaged books (or find ones at thrift stores) into the plant holder of your dreams with this novel (see what we did there?) idea. 29. From boring plastic planter into a novelty, clay cat plant holder – Does it get any better than this? Blitsy Crafts has produced a wonderful DIY project that both adults and children will enjoy creating. 30. You’ve probably seen similar dinosaur planters selling online or in stores for a small fortune, so you’ll be as pleased as punch to find out that High Walls Blog is here to teach you how you can create them yourself at home. We love this tutorial’s unique gold-dipped take on the dino planter trend. Thank you for sharing my log planter! Thanks you so much from bottom of my heart. I love your art and ideas . Thanks a lot for providing valuable information.I have some creative plant pots ,like wall planter and sky planter.